Experience a whole range of activities. Follow the signs of nature. The silence. The freshness of the air. 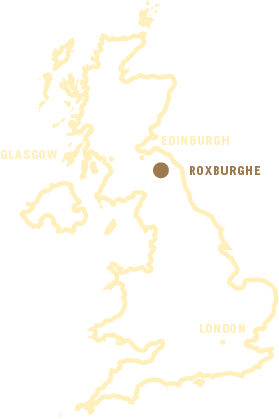 The originality of the Scottish natural landscape - the SCHLOSS Roxburghe Estate offers an extraordinary location: hilly landscape dominates the south, west and north of the region, whereas the east is primarily flat and even and has smaller hill groups. The famous River Tweed flows through the region from west to east, draining the area together with its many tributaries. For the last twenty miles of its course it forms the natural border with England and finally flows into the North Sea at Berwick-upon-Tweed. Schloss Roxburghe is perfectly situated to pursue numerous activities in fantastic and untouched nature. Whether a round of golf on the Championship Course, fly fishing on the river or trout pond, or even Clay Pigeon Shooting – the Estate offers a wide selection of opportunities to make your time spent with us extraordinary. Learn to fish in fantastic surroundings. Why the beauty of nature is the best catch? Create unforgettable experiences at The Fly Fishing Centre. a close eye on the target. Experience the art of Clay Pigeon Shooting or one of our other outdoor pursuits in beautiful surroundings, set within 500 acres of wooded parkland beside the River Teviot and close to the quaint Borders market town of Kelso. The Borderloop is a 250-mile circular bike journey along the quiet lanes that criss-cross this beautiful region, with several possible shortcuts offering alternative itineraries. Starting at 650 ft above sea level in Biggar and finishing on the coast in Berwick-upon-Tweed, the Tweed Cycle Way is an 89 mile long waymarked cycle route running through the heart of the Scottish Borders with the River Tweed as its linking theme. The 4 Abbeys Cycle Route is an 88km (55 mile) circular route linking the four main abbeys in the Scottish Borders, namely those at Melrose, Dryburgh, Kelso and Jedburgh. The Southern Borders Loop is a new route, which offers two options for cyclists. The shorter route is moderate and can easily be completed in a day. The larger circuit is hard (suitable for more experienced cyclists) with 5 significant climbs over 300m. The shorter route is best undertaken in a clockwise direction and can be started from either Newcastleton or Hawick. The longer loop is best cycled anti-clockwise and could be broken with an overnight stay in Newcastleton, Hawick or Langholm, depending upon the starting location. The Southern Borders has the 173 mile Reivers Route which winds its way through some of the wildest and untouched countryside in the UK. It starts at the mouth of the River Tyne and finishes on the Cumbrian coast with a short foray into the Scottish Borders. Finally there is the Coast and Castles route. This 200 mile route links the Forth and Tyne estuaries, taking in some of Britain's best built and natural heritage. Starting in Newcastle then passing Hadrian's Wall World Heritage site, the route travels on along unspoilt coastline, through the beautiful Tweed valley and Scottish Borders coastal towns before reaching Edinburgh. The shorter routes tend to be more suited to day trips and families with the longer distance routes requiring some overnight stops. Don’t forget that these longer routes could be undertaken in bite-size chunks by visitors just wanting to do a section of a route over a few days, rather than attempting the full distance. Scottish Borders history is strongly linked with horses: Border Reivers, Common Ridings, point to point races, eventing, racing, polo, endurance, vaulting and pony club activities. In fact, there are more horses per head of population in the Borders than anywhere else in Scotland. Kelso Races is the home of National Hunt Racing in the Scottish Borders. Kelso Racecourse is the ideal place to visit for a first-time race goer or a seasoned professional. The Scottish Borders provides excellent facilities for those who wish to have a go at riding. The open countryside with stunning views, horse friendly tracks and quiet country roads combine to offer many miles of enjoyable horse riding. If you would like to have a go at horse riding in the Scottish Borders, a member of our team would be happy to help organise this for you. Think of the Scottish Borders and think of big spaces: heather-clad rolling hills, hundreds of square miles of forests and woodland, lochs and rivers. The area is criss-crossed by a multitude of paths and fantastic long distance routes. The Scottish Borders is an excellent place to explore the beauty of nature by foot. Stroll through picturesque towns such as the charming old town of Melrose, discover fascinating sights in the numerous Abbeys, and explore awe-inspiring stately homes and castles. We will be pleased to advise you on your excursion and give you our insider tips. Just contact us. If you’re looking for outdoor activities and extreme sports, Scotland is the place to find them. If you would like to have a go at organising outdoor adventures in the Scottish Borders, a member of our team would be happy to help make your dreams come true. Water sports are well catered for at a variety of locations across the region. So whether its rib rides, whitewater paddling, playboating, canoeing or kayaking the Scottish Borders has many water courses to challenge you, including the internationally renowned River Tweed. If you would like to have a go at water sports in the Scottish Borders, a member of our team would be happy to help organise this for you.